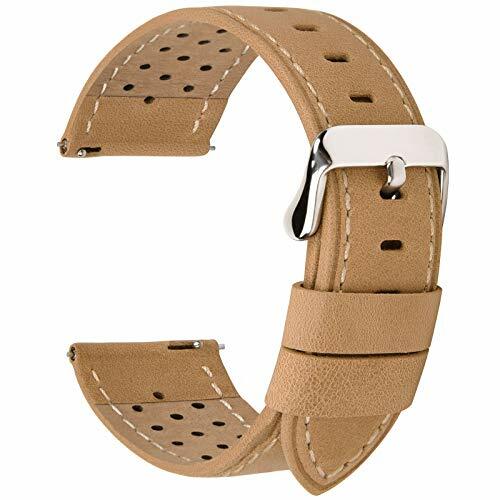 Premium Leather: Our watch band is made of upscale cowhide, ultra-soft and comfortable. The leather develops a shining luster over time. Certified RoHS compliant - free of hazardous and toxic substances. For more product options, please visit our store by clicking the blue Fullmosa logo above the product title. Unique Design: Features perforated ventilation hole design, wrist can maintain breathable comfort at any time. Metal part adopts stainless steel square buckle, sturdy and classical. Easy Installation: Quick release pin design in both ends of watch band allows you to install the new watch band with your finger in seconds, we also provide one spare spring bar and one assistant tool to help you swap the watch strap. SIZE: ONLY fit 20mm,NOT fit 19\21mm. So measure your watch lug width before ordering; 20mm fits Samsung Gear S2 Classic（not fit Samsung Gear S2）Huawei Watch 2; Moto 360 2nd Gen Men's 42mm; Pebble Time Round Large; Rolex Datejust Ref. 1601; TICWATCH 2; Withings Steel HR 40mm; Amazfit bip. Fullmosa Guarantee: Please ensure you choose "Sold by Fullmosa" for guaranteed quality. We are the ONLY authorized retailer of our brand. If you have any problems with your order please contact us for prompt and courteous service. Our contact information can be found on the every genuine Fullmosa box.